This entry was posted in Miscellaneous and tagged DNeasy, metagenomics, Qubit 1x dsDNA HS Assay Kit, Qubit 3.0, water filter on 11 April, 2018 by kubu4. 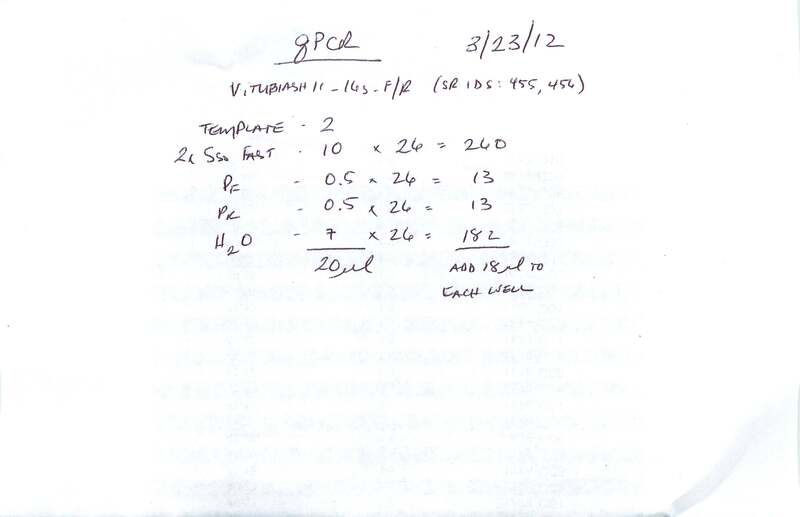 Ran qPCR on the Taylor water filter DNA extracts from 20120322 using V.tubiashii VtpA primers (provide by Elene; no SR ID?) instead of 16s primers, which failed to produce acceptable results in the melt curves (see 20120323). Additionally, Elene has a standard curve for V. tubiashii (from 1/12/2011) based off of CFUs/mL, which will allow us to quantify theoretical number of V.tubiashii CFUs present in each sample. Master mix calcs are here. Plate layout, cycling params, etc. can be found in the qPCR Report (see Results). Mean CFUs per qPCR reaction / template volume per qPCR reaction x filter extraction elution volume (100uL) = total CFUs on water filter. Sample #410 was from the only tank that exhibited mortalities and was the only group of oyster larvae that showed any expression from the V.tubiashii genes (see DATE). 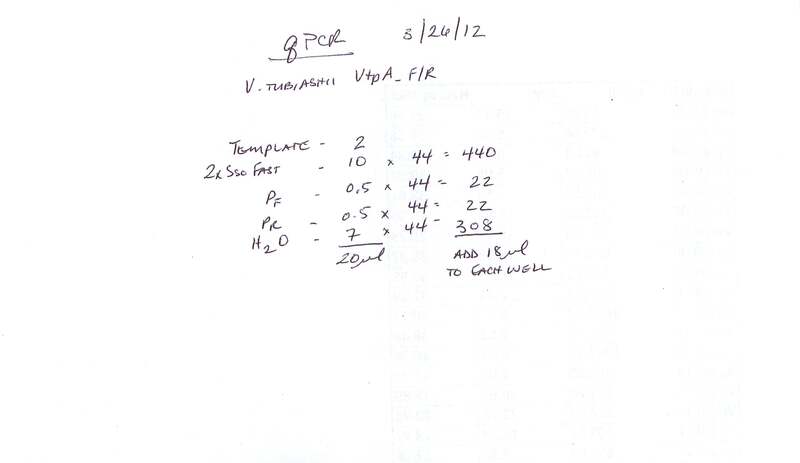 This entry was posted in Miscellaneous and tagged CFX96, DNA, qPCR, Vibrio tubiashii, VtpA, water filter on 26 March, 2012 by kubu4. Repeated exactly what was done earlier today due to apparent contamination in negative controls. Essentially the same results as the previous run. No template controls do amplify, but EXTREMELY weak and late. Melt curve analysis shows that the signals for the no template controls don’t cross the threshold set by the software. However, I just looked back at the qPCR results from 20120208 where I used these V. tubiashii 16s primers and realized I got the same results from the cDNA (double-peaks in melt curves and amplification in the no template controls)!! So, I suspect that this primer set isn’t that useful. Will have to examine other sets of V. tubiashii 16s primers to use. Will discuss with Steven. This entry was posted in Miscellaneous and tagged 16s, CFX96, DNA, qPCR, Vibrio tubiashii, water filter on 23 March, 2012 by kubu4. Ran qPCR on the Taylor water filter DNA extracts from yesterday using V.tubiashii 16s primers (SR IDs: 455, 456). Used RE22 DNA as a positive control, provided by Elene. Master mix calcs are here. All samples were run in duplicate. Plate layout, cycling params, etc can be found in the qPCR Report (see Results). All samples amplified, including the negative controls. Negative controls exhibited very weak, late amplification. Additionally, many of the samples have a “shoulder” or apparent double-peak present in the melt curves. Will repeat to see if I can eliminate amplification in negative control samples. This entry was posted in Miscellaneous and tagged 16s, CFX96, qPCR, RE22, Vibrio tubiashii, water filter on 23 March, 2012 by kubu4. Filters were cut into ~13 pieces and placed in 1.5mL snap cap tubes containing 50uL of Proteinase K and 400uL of Buffer AL. Samples were incubated O/N @ 56C. Tubes were spun @ 16,000g @ RT for 2mins. 400uL of 100% EtOH was added to each tube and vortexed. Tubes were spun @ 16,000g @ RT for 2mins. Supe was transferred to Qiagen column. Qiagen protocol was followed from this point on. 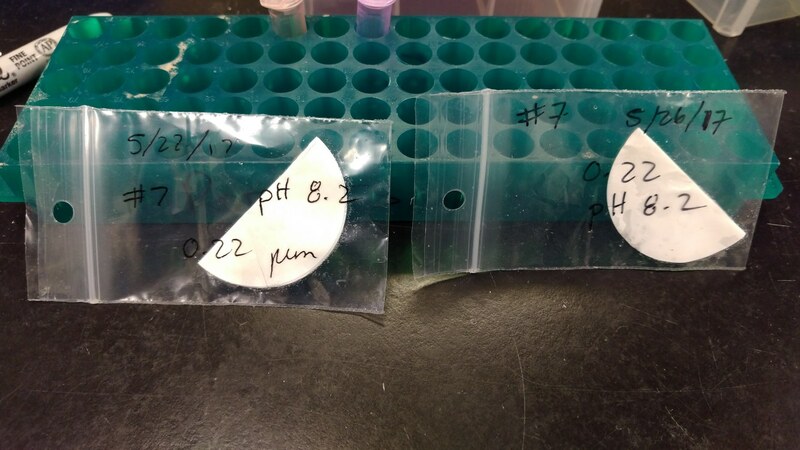 Samples were eluted with 100uL of Buffer AE and stored @ 4C. This entry was posted in Miscellaneous and tagged DNA Isolation, DNeasy, gDNA, Vibrio tubiashii, water filter on 22 March, 2012 by kubu4.